Every now and then a holiday house comes available that has the WOW factor and this is it. You won't even make it to the front door before you are swept away and excited by the stunning coastal and beach views. Oh my... what a rare and special find. Spacious quality beach living at its very best and the perfect property for families to come together . Fully equipped kitchen flowing through to open plan dining and living area. Large doors opening on to deck maximising the indoor outdoor flow and the ocean views. You can almost reach out and touch the water. 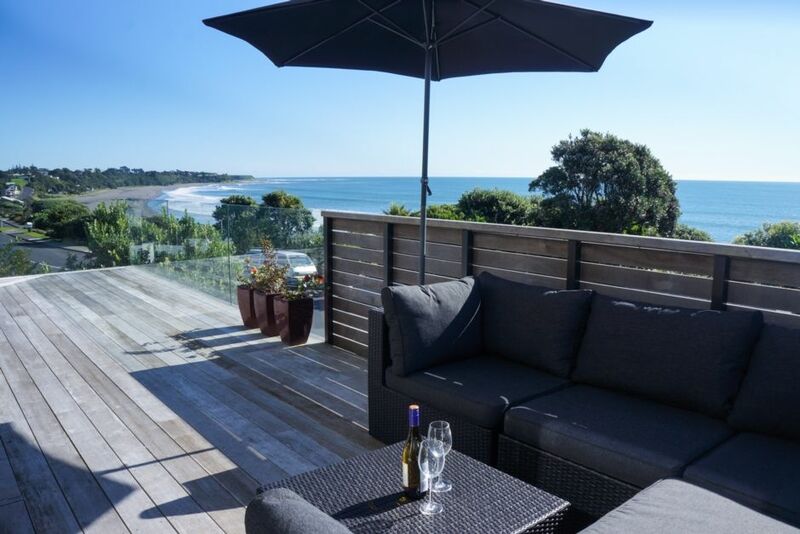 Sit back relax and enjoy a glass of wine and watch the surfers, windsurfers and beach goers. Watch the waves rolling in and breathe in the sea spray, pure joy and total relaxation. In the winter curl up by the gas fire and watch the waves crash in to shore. You have everything you need here for a cosy quality holiday. Four spacious bedrooms; two with amazing seaviews, WIFI, 2 quality bathrooms and space for your entire family to enjoy their holiday experience. Wander directly across the road to beach access and spend your days exploring what this beautiful Oakura beach has to offer. Take a five minute stroll to the funky village shops where you can restock your supplies, relax with a latte at the High Tide Cafe and select one of the many restaurants to dine at in the evening. New Plymouth City is only a ten minute drive along the scenic Surf Highway 45 where you can take in the Arts, Culture and Shopping. You will love staying here!!! So book it today. Special conditions: - No parties or large gatherings - Respect neighbours peace and quiet. Wonderful location, extraordinary views, nice, comfortable and spacious house with a deck all around it. Only let down by a poorly equipped kitchen and absence of pictures and / or decoration on the walls. Great location. Worked well as a family unit to stay. Great modern accomodation. Plenty of heating. Great ocean views. Anazing stay thanks! Lovely house with an outstanding view. The property is spacious, well-presented and comfortable, with a lovely view of the beach. The property is spacious, well-presented and comfortable, with a lovely view of the beach. We really enjoyed our stay and the fact that it's so close to the beach. The location was excellent and we were lucky enough to have a perfect day to enjoy the views. The location was excellent and we were lucky enough to have a perfect day to enjoy the views. We would like to point out the need for lighting on the exterior stairs as it was very dangerous at night for our elderly parents trying to negotiate their way in the dark.